Sasha Pivovarova and Ash Stymest ph by Steven Meisel. Couture supplement cover: Rihanna ph by Steven Klein, that one is fierce. Lara Stone gets makeover — brown hair and visible brows— ph by Mert & Marcus. Main editorial ‘Gloria’ sees Lara being styled as a vintage seductress in loads of lace and cashmere coats. The past few years’ September issue’s amount of pages went like this — 832 pages for 2006, 840 pages for 2007, 798 pages for 2008 and now 584 pages for 2009. 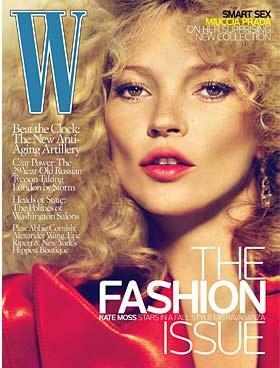 Kate Moss in Burberry on 28th Vogue UK cover, shot by Marios Testino. See all her other Vogue UK covers here. 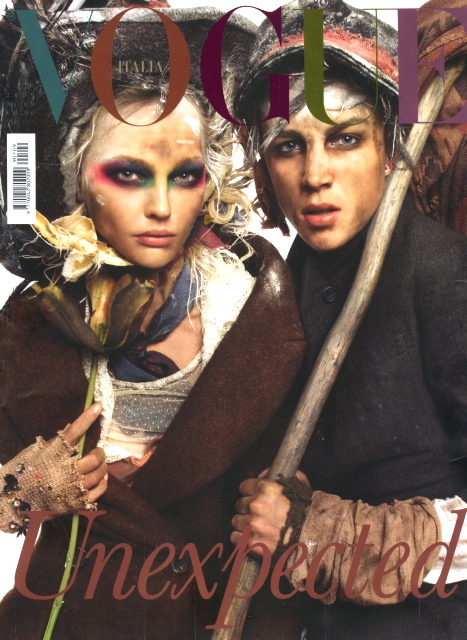 Her second Vogue Germany cover… previously — July 2008, also by Alexi— is her first ever Vogue cover. Zhang Zi Yi. Funny, they have ‘The Black Issue’ every September, nice way to cue Fall/Winter? Chanel Iman took the honour last year. Cate Blanchett in Balenciaga, Martin Grant and Alexander McQueen illustrated by David Downton. Love how vintage these covers look, Vogue Australia is celebrating their 50th Anniversary. Always nice to see Coco, but the cover feels very Vogue Espana. Margaryta Senchylo. I’m LOVING their recent covers, last month’s with Eden Clark is lovely as well, they have been using models who suddenly disappeared off the radar. Lara Stone ph by Karl Lagerfeld, she is bagging two french covers for September, and two of the most influential french magazines! One thing that got me thinking, Lara is wearing Chanel couture Fall 2009, which was shown on the runways in early July… did Karl shot her in this right around that period. It’s good to have the designer as the photographer as well, no? Couture pieces straight off the runway to a magazine cover. Alana Zimmer, words got out that she’s just chopped all her long locks off? Can’t wait to see her new look. Kate Moss in Prada ph by Mert & Marcus. Pretty young things — Chanel Iman, Sessilee Lopez, Jourdan Dunn and Arlenis Sosa. Pretty epic. 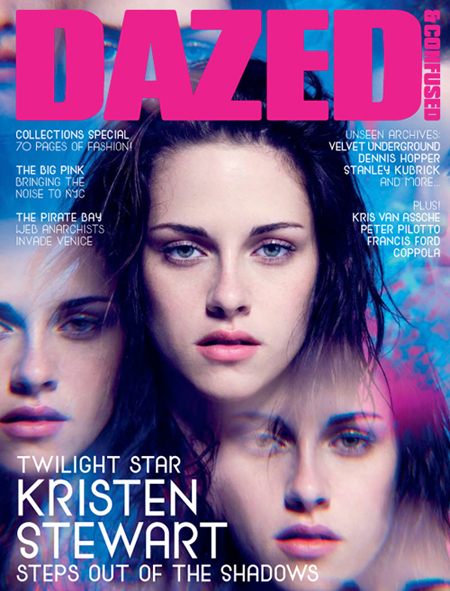 Kristen Stewart ph by David Sherry. 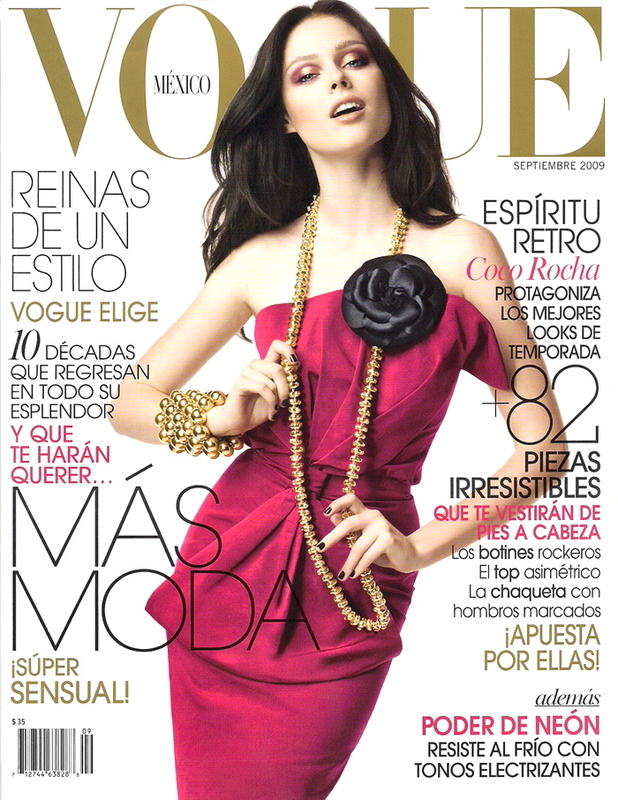 I’m sorry Mexican Vogue does not feel like Spanish Vogue. Seriously this has been the most mexican and most representative of Mexico in a while. The rose, the gold, the red, the model, the hair, this is how affluent ladies look like in the homeland! Eva looks great in Numero Tokyo. She’s been around A LONG TIME and still looks fresh and young. Love EVA! I am soooo HATING W Magazine right now. I’m definitely NOT renewing my subscription after it runs out this year. It was one of my favorites 5-6 years ago. Now it’s TRASH! Utter trash! The last three issues took me less than 10 minutes to browse through and half of the content were completely SH*T. Stop using Steven Klein or Jurgen Teller already. All their photos look the same. You can get Madonna, Brad and Bruce to pose for your magazine but they all still look the same. I missed Vogue Brazil with Ana Claudia Michels wonderful in the cover! Amazing! Not clear for me, how offen you updating your rockthetrend.com.